The medieval legacy of Telugu warriors and peasants lives on. Much of the information that can be found on India’s ethnic and linguistic history focuses on the people of northern India. To an extent, this reflects a nationalist reading of Indian history, that sees the modern Indian state as the direct heir to a linear series of pan-Indian empires, most of which — Maurya, Gupta, Mughal — were centered around the Ganges plains of the north. The history of southern India is much more obscure, but no less important. After all, the bulk of India’s maritime trade and cultural influence on the rest of Asia radiated out from southern India. And the influence was two-way: Europeans, Christians, Jews, and others first arrived in South India. Partially, this historical bias is a reflection of the availability of sources, the interests of academics, and the fact that the historically and demographically most important languages of India (Sanskrit, Pali, Hindi, Urdu, Bengali) are all from the Ganges river valley, although there is some academic interest in Tamil, spoken in the southernmost part of India, because it is the Indian language with the longest continuous literary tradition. The four major Dravidian groups of South India — Telugus (of Andhra Pradesh and Telangana), Tamils (of Tamil Nadu, and also of northern Sri Lanka), Kannadigas (of Karnataka), and Malayalis (of Kerala) — have interesting and dynamic histories. While the origins of the Dravidian peoples are obscure, recent linguistic and genetic research indicate that the Dravidian people and languages radiated across central and southern India about 4,500 years ago, and that their formation was probably linked with the arrival of Iranian farmers in the subcontinent, who mixed with indigenous hunter-gathers. In particular, the influence of Telugus, also known as Andhras, on shaping the course of South Indian’s medieval and early modern history is particularly noteworthy. Nor is it insignificant, as Telugu is the largest South Indian language by speakers, and the fourth largest language in India today (my family is of Telugu origin). In fact, Telugu warrior nayaks (chiefs) were the ruling class over much of South India — including ethnic Tamil and Kannada areas — and were in some ways, served the same function as the rajput warrior clans of northern India. The last dynasty to rule Sri Lanka before the annexation of the Kingdom of Kandy by the British, were also Telugu nayaks. Perhaps this history is obscured because the Telugus were ruled by several intermediary empires, such as the Mughals, Marathas, Nizams of Hyderabad, and the British, between their heydays and the present. Unlike the rajputs, the nayaks didn’t always form a corporate group. It may seem as though the Telugus had always inhabited present-day Andhra Pradesh and Telangana, at least from the the time the first historical records, about 2,200 years ago (the Telugus of those two states diverged because most of Telangana came under Muslim rule after the fall of the Telugu Kakatiya Dynasty in 1323, while Andhra Pradesh was ruled by the Hindu Reddy and Vijayanagara empires.) After all, ancient inscriptions from the Satavahana Empire, a breakaway state of the Mauryan Empire in the Deccan, contain some ancient Telugu, in addition to a language ancestral to Marathi. Yet, most Telugu inscriptions found between the formation of the Satavahanas, around 230 BCE and around 1,000 CE, come from a narrow, but fertile region between the Krishna and Godavari rivers on the central and northern Andhra coast (there is a strong correlation in South Indian history between inscriptional languages and ethnic geography). The Andhras were a relatively minor group throughout most of history, compared to the much more prominent Tamils and Kannadigas. In other words, Telugus in ancient times did not inhabit the vast majority of what is today a Telugu speaking region, most of which is situated on a plateau west of the coastal Eastern Ghat mountain range: this area was sparsely populated, and dry in ancient times (see map). According to the historian Cynthia Talbot, the Telugu inscriptional sphere doubled between 1175-1324, during the Kakatiya Dynasty, which itself began on the frontier of the Telugu-speaking areas, and expanded westward from the coast into the uplands, mostly displacing Kannada speakers or tribal peoples. It seems that both Telugu peasants and warriors were suddenly able to spread in large numbers because of the development of new agricultural techniques — the tilling of dark soils — that enabled the colonization of arid lands. Farming much of the Deccan plateau requires the use of water tanks (reservoirs) and other dry-irrigation methods perfected by Telugus in the early medieval period. Today, Telangana is known as a “tank district.” In turn, this habituation of Telugu warriors to live in arid territories seemed to have engendered a hardiness that would later prove useful in conquering and administering territory. Telugus also expanded southward, into Tamil areas. Several years ago, when I visited the great temple towns of Tirupati and Tirumala in the arid Rayalaseema region of Andhra Pradesh, very close to the southern border of that state with Tamil Nadu, I noted that the earliest inscriptions in the ancient Venkateswara Temple were in Tamil. Later inscriptions shifted to Kannada, and finally Telugu. Taken altogether, the inscriptional and historical evidence is clear: Telugus displaced Tamils in this area. 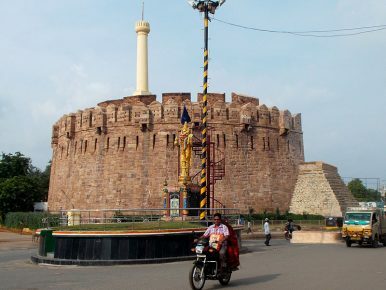 Later, after the Kakatiya Dynasty fell to the Delhi Sultanate, more Telugu warriors fanned out southward into Tamil areas under the leadership of the Vijayanagara Empire (centered mostly in today’s Karnataka and founded by Kannadiga survivors of the Delhi Sultanate conquest of the Hosalya Kingdom), which came to rule Andhra Pradesh, and came to rule major Tamil cities like Madurai. By the sixteenth century, under the aegis of the Vijayanagara Empire, Telugu had emerged as the prominent elite language throughout South India, because it was the language of much of the warrior class, and was patronized by the Tuluva Dynasty of Vijayanagara, itself ethnically Tulu, a relatively small Dravidian group from coastal Karnataka. The dynasty’s greatest ruler, Sri Krishnadevaraya was also a well-known Telugu author. The last dynasty of Vijayanagara, the Aravidu, was in fact, Telugu, and ruled the shrinking empire from the Rayalaseema region of Andhra Pradesh. Meanwhile, on the other side, the Qutb Shahi dynasty of Telangana also came to employ Telugu warriors, many of whom spread their culture further north and west into the Deccan and towards Maharashtra. Eventually, most of the area under the control of Telugu lords came under Mughal, Maratha, and British rule, and the nayaks were displaced from power. However, the medieval legacy of Telugu warriors and peasants lives on, and Telugus remain the largest South Indian ethnic group. The Battle of Talikota is one of the most important battles in South Asia’s long history.